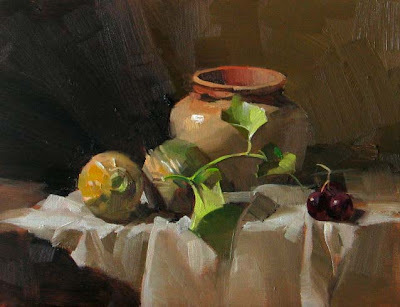 I want this painting to show the difference between painting the objects and painting the light. Don't you think it worked? 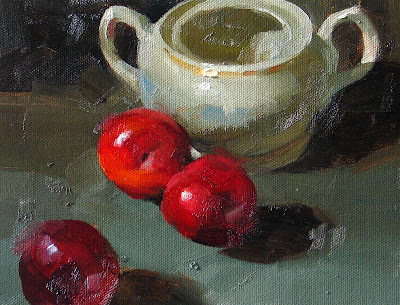 I have painted many fruit, but now I am trying more on painting vegetables. As eye-candies, they are equally sweet. We have cantaloupes growing in our yard, but they could not get big some how. 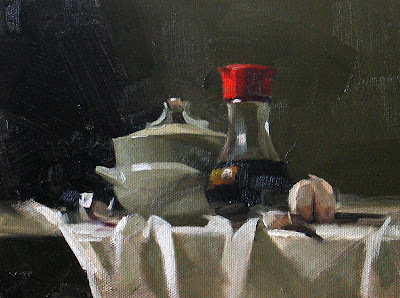 I don’t know how well they taste, but they are certainly make good still-life subjects. This painting will be shown at Galerie Kornye West at Fort Worth, TX. The URL is: http://www.kornyewest.com/. 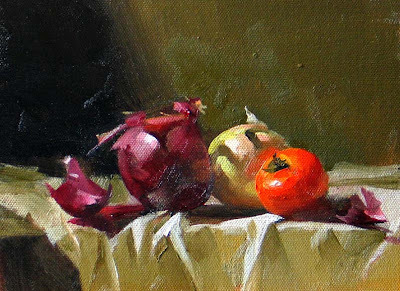 I haven't done many paintings with onions, but I find that I really like the texture of it. It has a different tast. You might wonder what the white object is at the front. It is a bird feed, which is used to hold a small amount of food for birds in a cage. I got it from my mother-in-law. 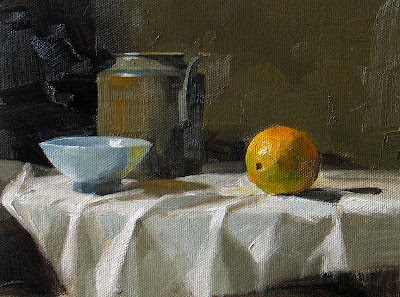 It works so well for still life compositions. 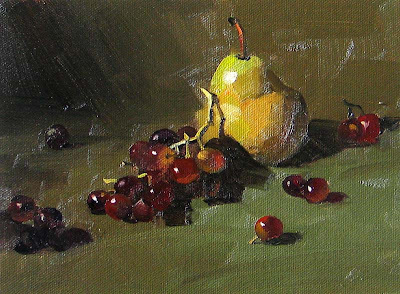 Yesterday I gave my first painting demonstration and this is my demo piece. 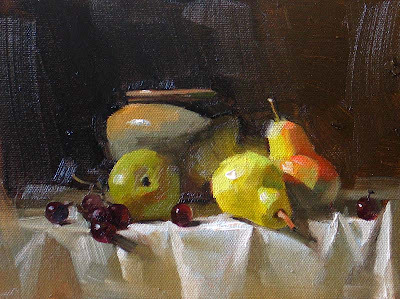 This event was organized by a local artists group: Plein Air Austin. 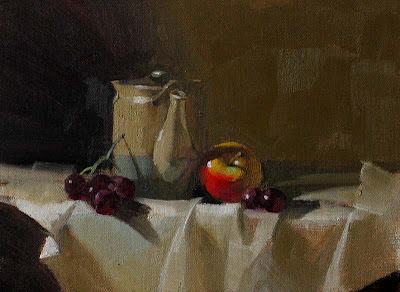 The demo was performed at the Windberg Art Center in Georgetown Texas. I want to thank both PAA and the Windberg Art Center to make this activity possible. Today I have reached the milestone: 100 posts on my blog. Since I started this blog in January, I have received enormous amount of help and support. 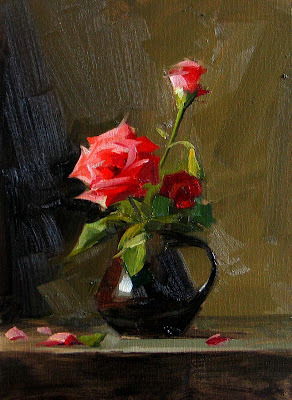 At this moment, I want to express my sincere appreciation to my collectors for your patronage. 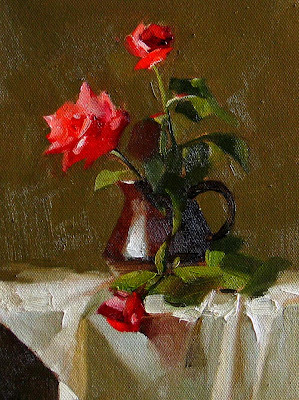 I want to thank my artist friends who have commented on my paintings. I didn’t get a chance to response to you all, but your messages were well received. I feel really great to have this opportunity on-line to share my art with you, and sincerely hope that my effort can bring you happiness. 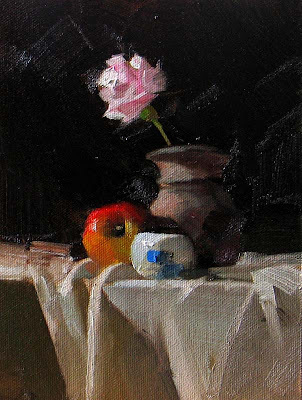 I will give a still-life painting demo on 8/16/07 at Windburg Art Center in Georgetown, TX. It is a free event. Please check www.pleinairaustin.org/calendar.htm for details. We planted rose bushes in the spring, but didn’t realize they were too close to the AC compressor. The Texas summer comes. The high temperature plus more heat from the AC are all dumped on the plant. But to my surprise, they grew well and bloomed. The flowers are so beautiful. I must paint them. 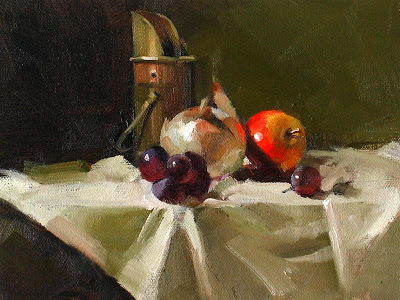 For a while, I put a lot of vibrant colors on my paintings, but I am testing more subtle colors lately. After having too much Texas BBQ, I want to have some green tea. 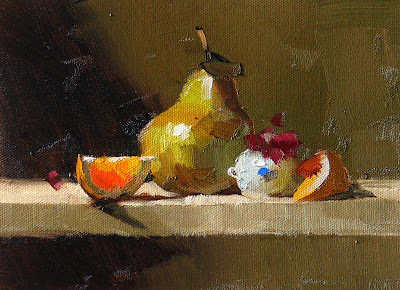 I borrowed this composition from David Leffel. 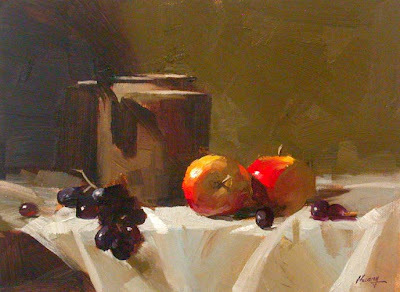 He is one of my favorite still-life artists. I took his workshop three times and really learned a lot.